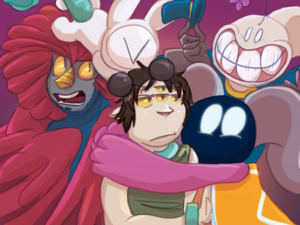 Now that Cosmic Fish has joined the SpiderForest collective, this website will be where everything will be posted a day earlier from Tapas, and eventually, Webtoons. A goal with Patreon would be to upload videos and post them on the blog. For Cosmic Fish, at least, speedpainting and speedanimations relating to the comic. (As well as some ideas but this needs a small team and am waiting for a friend to heal up to get started). So, it would be AMAZING if you consider to support this webcomic if you have the spare change or at least share and help the comic along, I really appreciate it and it helps out A LOT! This March 18-19, the first publishing of a Cosmic Fish chapter, as well as unique merchandise (prints, pins, bookmarks, keychains) will be sold in this year's Tintero, the independent comic and art festival where a short Cosmic Fish story already won an award last year! (Damn, it's been a year already! ), and please be aware, the location has moved from Río Piedras, to Bayamón, so be sure to check out specifics here, if you're in the area. Take care, friends, and stay awesome!